There was not a way for Internet Explorer 7 users to log into two different Gmail (or Hotmail, Yahoo Mail...) accounts at the same time. Gmail can be replaced with any other cookie based web service that asks the user to login. Logging into two accounts at the same time can be beneficial, for instance when you manage multiple work-related accounts or a work and home account. The problem here is that the cookie storing the information about the login will be overwritten when the second login attempt is made. Internet Explorer 8 changes this behavior by introducing so called session cookies. A user wanting to log into an account a second time (or third, fourth..) could start a new session in Internet Explorer 8 to do so. The new session would write a new cookie that would not interfere with the old cookies that have been written in other sessions or previously. 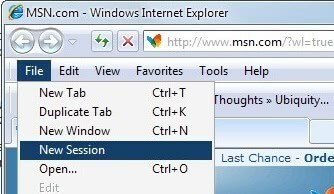 A new Internet Explorer 8 session can be created from the Internet Explorer menu toolbar which might be hidden on your computer system. The fastest way to create a new session if the menu bar is not shown is to press the keyboard combination [Alt f] [i] [enter]. This will open a new Internet Explorer 8 window in a new session. Opening a new tab or window in contrast would share the cookies in Internet Explorer 8. It is furthermore possible to start a new session from the command line by launching iexplore.exe with the -nomerge parameter. Internet Explorer 8 sessions are a very effective way of accessing multiple accounts from the same web service at once. Microsoft should think about placing that option more dominantly in Internet Explorer 8 as its current position will most likely not be noticed by many Internet Explorer users. Firefox users can create and use so-called profiles that the browser supports. Other options include using Firefox's Container feature, or installing browser extensions in browsers such as Gmail Account Manager for Firefox, or Swap my Cookies for Google Chrome. New versions of Internet Explorer support the Session functionality of Internet Explorer as well. Just tap on the Alt-key to bring up the menu and select File > New Session to start a new session. Any sign-ins you make there don't affect any other browsing session that you have open at the time. A look at Internet Explorer 8's new feature to work with multiple browsing sessions that allows users to sign into sites multiple times. but it works with google account??? You can do something similar in Firefox using PROFILES. Not as easy but possible. I agree with abbas. Firefox with the CookieSwap add-on enables users to switch between cookie profiles. I switched to Firefox to alleviate the headache of constantly logging into yahoo, Facebook, etc. CookieSwap keeps track of all the cookies associated with my profile. I would go back to IE if someone in the add-on community could provide the same functionality. Just as the Cookiepie Firefox Extension! This is just not working for me. I’m sure I’m doing everything right. every time I open the second window and type http://www.gmail.com it opens the same account as in the first window???? Anybody else figured out something else about this or a system setting that has to be in place for it to work? What are you talking about? With IE7 that’s the feature I always liked about it – and one I hate about IE8 – with IE7 I could always open a new browser window and log into one of my other email accounts (both Yahoo). I couldn’t do it in a new tab, but with a new window it worked every time, and I could open several different Yahoo email accounts. Here you’re saying it couldn’t be done, but it can be done with IE8. You have that backwards! I have tried this “new session” and it does NOT allow me to log into another email account, it always opens the same email account that’s already open in the other browser window.